Though it feels like several eternities, it’s been about a year since Trump was inaugurated. 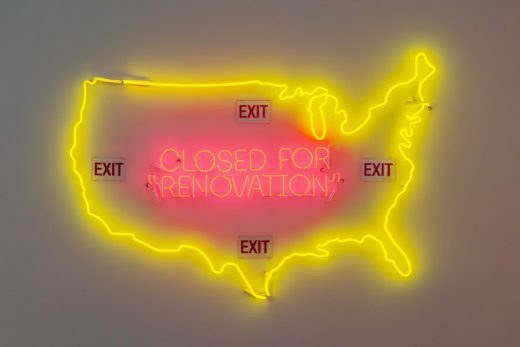 A large array of artists have been asked to channel their rage and other such emotions into their work, resulting in the wide spread that is One Year of Resistance, a group show at The Untitled Space in Tribeca. 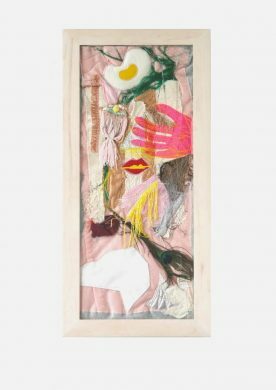 This gallery is no stranger to art that responds to the current political climate; the month of the 2017 inauguration they presented group exhibition Uprise / Angry Women. For One Year of Resistance, which serves as a follow-up to Angry Women, curator and gallery director Indira Cesarine has asked over 80 artists of all genders to contribute work inspired by “the controversial policies and practices of our current president.” The work ranges from literal depictions of Trump to more symbolic renderings of #resistance. Can you believe it’s only been a year? Opening Wednesday, January 17 at BRIC House, 7 pm to 9 pm. On view through February 25. Historical reenactment is typically only referred to in terms of the eager, largely-white people who don period dress and perform old American wars in places like colonial Williamsburg (Virginia, to clarify). Little did some of us know, it’s so much more than that. Group exhibition Reenactment delves into the politics of historical reenactment and what narratives get privileged along the way. Six artists of color use performance, photography, textiles, and more to take on stories such as modern-day gentrification in Bed-Stuy, traced through an amateur kung fu film found at the former home of a theater frequented by Reverend Al Sharpton; the Syrian refugee crisis and conflict, mixing media coverage and first-person accounts; and the actual Revolutionary War’s 1776 Battle of Brooklyn, conducted by a woman of color. Opening Saturday, January 20 at 630 Flushing Avenue, 6 pm to 10 pm. On view through February 10. What happens to art gallery frames after exhibitions end? Oftentimes, they’re discarded. But that’s not the end of their life, per se, not when the Re: art show’s latest endeavor Re: Framed exists. Guest curated by Jane Cavalier and Nicole Knack, the 18th edition of this ever-changing show features 11 artists utilizing frames no longer wanted by large art institutions in the city. This could mean the standard interpretation of placing a piece of art in a frame, or a more practical interpretation of using the frames as raw material for the artwork itself. Many of the works are inspired by the frame’s former occupant, which for some was a work by a big name like Andy Warhol. At this show, being framed is a good thing. Opening Saturday, January 20 at The Loft at Elsewhere, 7 pm to 11 pm. On view through February 2. The last time we checked in with all-female design collective 3xStudio, they were turning an old metal-walled noodle factory into an exhibition space. For their latest endeavor, they’ve turned to a place that’s a bit more polished: the funky second floor loft space of Elsewhere, the new Bushwick venue and art space from the Glasslands team. 3xStudio is comprised of designers Claudine Eriksson, Andrea Johansson, and Darcy Moore. 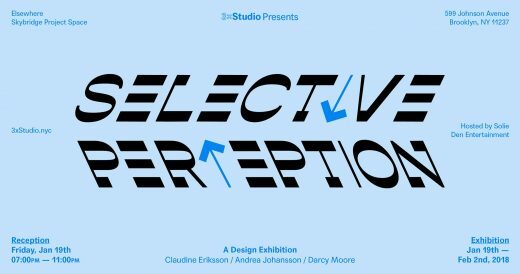 Fittingly, their exhibition revolves around each of the three designers creating three vector illustration interpretations of a word. The three three-letter words doled out to the designers are “big,” “hot,” and “new.” Simple as they may sound, surely there’s a whole world of ways to represent them.